Interesting election results in the UK over the weekend, where the Conservatives romped to victory. This was despite a widespread consensus that neither the Conservative or Labour party would get a majority. This was a triumph for uncertainty and random error over the deterministic, as none of the statistical forecasts appeared to deem such a decisive victory probable. The UK election is a lot harder to model, for numerous reasons, when compared to the US. This means that a lot of pollsters and political forecasters will have to go back to the drawing board and re-evaluate their methods. Obviously, the models used to forecast the 2015 election could not handle the dynamics of the British electorate. However, there is a high degree of persistence within electuary constituencies. 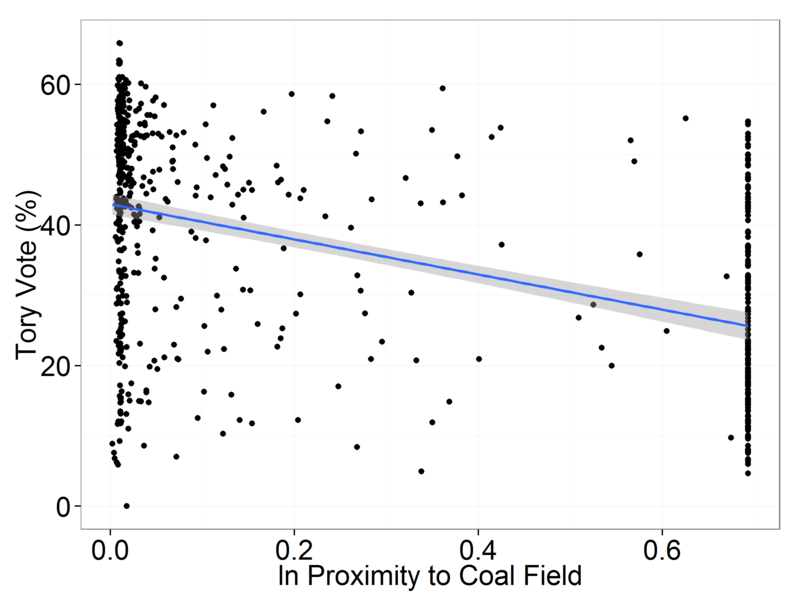 Let’s explore this persistence by looking at the relationship between coal and % Conservative (Tory) votes. Following a tweet by Vaughan Roderick and using the methodology of Fernihough and O’Rourke (2014), I matched each of the constituencies to Britain’s coalfields creating a “proximity to coal” measure. What the plot below shows is striking. Being located on or in close proximity to a coal field reduces the tory vote share by about 20%. When we control (linearly) for latitude and longitude coordinates, this association decreases in strength, but not by much. For me, this plot highlights a long-standing relationship between Britain’s industrial revolution, the urban working class, and labour/union movement. What I find interesting is that this relationship has persisted despite de-industrialization and the movement away from large-scale manufacturing industry.